Fresh herbs and hot spices are combined to make the charmoula marinade that is used to flavour this delicious Moroccan style dish. Crusty bread makes a good accompaniment. Cut the white fish into large even size pieces, discarding any skin and bones. Place the fish in a large shallow dish. Blend together the ingredients for the charmoula. Season with salt. Pour over the fish, stir to mix and leave in a cool place, covered with clear film (plastic wrap), to marinate for 2 – 4 hours. Heat about 5mm / 1/4in oil in a large heavy pan, add the potato slices and cook, turning them occasionally, until they are cooked right through and golden brown. Drain the friend potatoes on kitchen paper. Pour off all but 15ml / 1tbsp of the oil from the pan and add the onion, garlic and tomatoes. Cook over a gentle heat for 5-6 minutes, stirring occasionally until the onion is soft. Place the potatoes on top and then add the spinach. 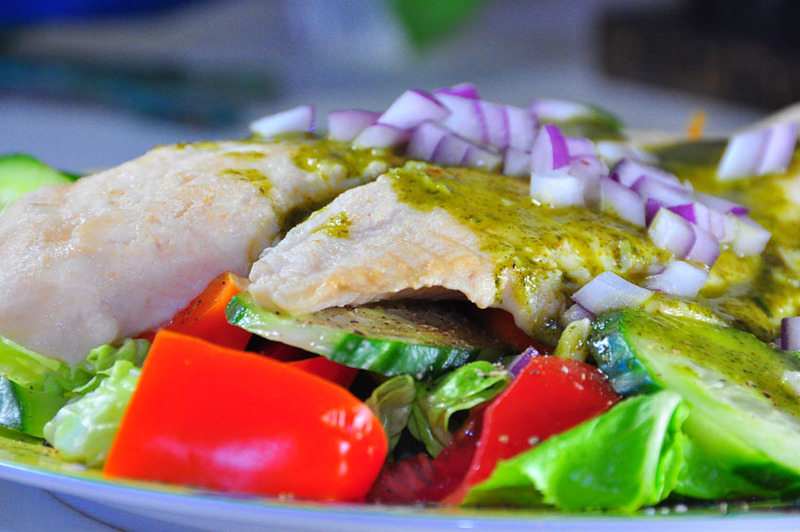 Place the marinated fish pieces on top of the chopped spinach in the pan and pour over all of the marinade. Cover the pan tight;y and cook for 15-18 minutes. After about 8 minutes of the cooking time, carefully stir the contents of the pan with a wooden spoon, so that the pieces of fish at the top are distributed throughout the dish. Cover the pan again and continue cooking, but check occasionally – the dish is cooked once the fish is just tender and opaque and the spinach has wilted. Serve the dish hot, with wedges of lime and plenty of warm crusty bread, if you like. This entry was posted in One Pot and tagged fish with lime and chilli, fish with lime and coconut, fish with lime and coriander, fish with lime and ginger, fish with lime juice, fish with lime recipes, fish with lime sauce, lime butter fish on April 17, 2013 by Jeff. The red wine sauce adds colour and richness to this wonderful dish. Halibut and John Dory are also good cooked this way. Preheat the oven to 180C / 350F / Gas 4. Season the fish fillets on both sides with salt and ground black pepper. Generously butter a shallow flameproof dish, which is large enough to take all the brill fillets in a single layer. Spread the shallots in an even layer in the dish and lay the fish fillets on top. Season well with salt and ground black pepper. Pour in the red wine and fish stock, cover the dish with a lit or foil and then bring the liquid to just below boiling point. 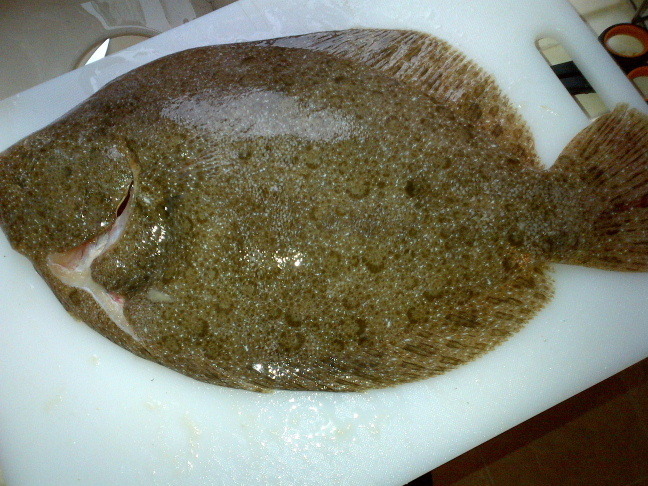 Transfer the dish to the oven and bake for 6-8 minutes, or until the brill in just cooked. Using a fish slice (metal spatula), lift the fish and the shallots on to a serving dish, cover with foil and keep hot. Transfer the dish to the stove and bring the cooking liquid to the boil over a high heat. Cook it until it has reduced by half. Lower the heat and whisk in the chilled butter, one piece at a time, to make a smooth, shiny sauce. Season with salt and ground white pepper, set the sauce aside and keep hot. Divide the shallots amongfour warmed plates and lay the brill fillets on top. Pour the sauce over and around the fish and garnish with the fresh flat leaf parsley or chervil. This entry was posted in One Pot and tagged brill fish, brill recipes gordon ramsay, brill recipes rick stein, brill wiki, roast brill, sauce vierge, turbot recipes, whole brill recipes on April 3, 2013 by Jeff. This rich gratin is a Swedish favourite. This is likely everyones temptation as Jansson is a common Swedish name. Preheat the oven to 200C / 400F / Gas 6. Use 15g / 1/2oz / 1 tbsp of the butter to grease a shallow 1.5 litre / 2 1/2 pint / 6 1/4 cup earthenware baking dish. Using a small sharp knife, carefully cut the potatoes into thin slices, then cut the slices into fine matchstick strips. Toss the potato strips with salt and ground black pepper and sprinkle half of them into the base of the prepared ovenproof dish. Lay half of the onions on top of the potatoes, season with black pepper and dot with butter. Lay the anchovies on top of the onions, then add th erest of the sliced onions and top with the remaining potatoes. Mix the cream with 30ml / 2 tbsp cold water and pour this mixture over the potatoes and onions in the dish. Add a little milk if necessary to bring the liquid to just below the top of the final layer of potato matchstick strips. Dot the potatoes with the remaining butter, then cover the dish with foil and bake for 1 hour. Reduce the oven temperature to 180C / 350F / Gas 4 and remove the foil from the top of the dish. 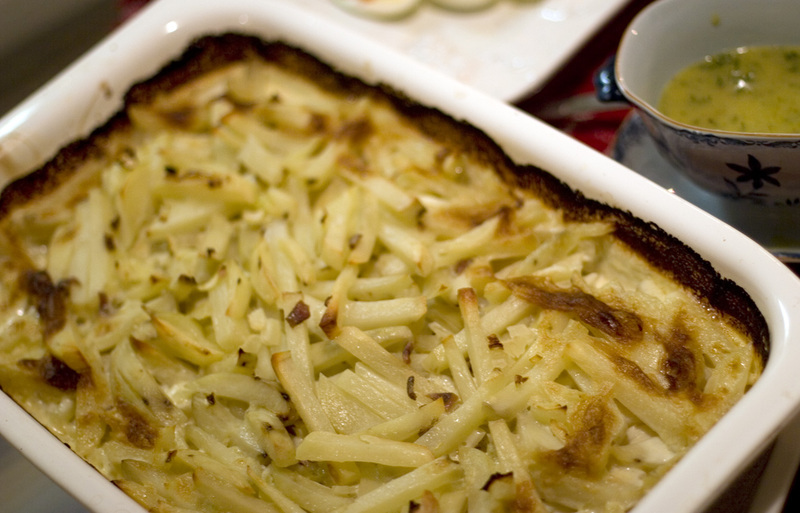 Bake for a further 40 – 50 minutes, or until the potatoes are tender when tested with a knife and brown in colour. This entry was posted in One Pot and tagged celeriac gratin recipes, easy gratin recipes, french vegetable gratin, gratin dauphinois, gratin food recipes, mushroom gratin, pineapple au gratin casserole, potato gratin on April 2, 2013 by Jeff.